I've recently been working on creating configuration files for tuning the 1982/83 ECCS ECUs, and have successfully configured TunerPro with Ostrich 2.0 emulation for real time tuning. I have posted this information on some Z-car forums, but thought I may share it here as well to help out anyone interested in using TunerPro on older generally unsupported Nissan/Datsun ECUs. Please note this is only for 1982/83 TURBO JECS ECCS, the 1981 Turbo ECCS has some significant differences. I have never worked with one so I do not know if they can be modified in the same way. There are several physical modifications required on the ECU to accept a single ROM. First, the 4-pin ribbon cable on the mainboard at 'IC3', and the two 12-pin ribbon cables at 'IC4' need to be desoldered and discarded. The HD47LS20P chip labeled 'IC3' on the daughter board needs to be desoldered and moved to the 'IC3' position on the mainboard. With the ribbon cables removed, the 'IC4' position on the mainboard can now have a 24-pin DIP socket soldered in place. This modification allows the ECU to run on a single ROM instead of the factory two ROM configuration. 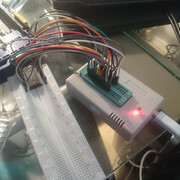 I used a pre assembled Commedore 64 2364-type ROM adapter to use a 28c256 EEPROM, or plug in the Ostrich 2.0 with its included 28-pin rom adapter. By default the 2364-type ROM adapter ties the first address lines high, so the ECU will address the last 64K of space on the chip. This is the reason the XDF file specifies address at 0x6000 and up. To read the factory BINs, the file will need to be offset by hex 6000 in your favorite hex editor. The address identification spreadsheet is fairly obscure, but I hope easy to interpret. All values marked in green I have verified their function through testing. Also note I did interpret some data, such as ignition duty dwell & temp sensor conversion, based off existing Z31 XDFs, so credit to whomever created those. I've created a google drive folder with the factory BINs, map data address sheet, XDF, and other relevant files. Unfortunately this is more of a novelty than a practical tuning solution. The AFM 'flapper' is a severe limitation to the fueling accuracy, I doubt this ECU can support much higher power levels as well as a Z31 MAF-based unit, or modern standalone. 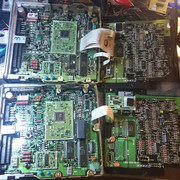 Top is unmodified ECU, bottom is modified unit with 28c256 rom.